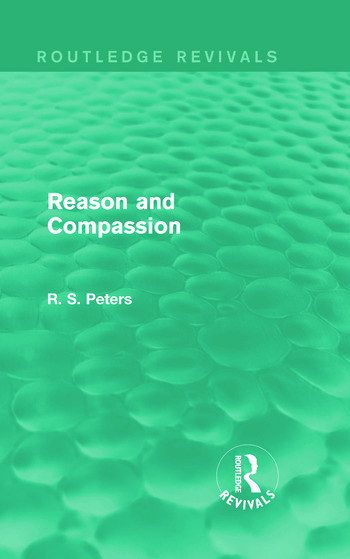 First published in 1973, Reason and Compassion showcases a collection of lectures by Professor Richard S. Peters concerned primarily with the moral position, based on compassion and on the use of reason, which is critical to code-encased moralities. He reacts to the idea that whilst many people are sympathetic towards protests against an established moral code, they are reluctant to align themselves with modern forms of nihilism, subjectivism and romantic revolt. The work studies the implications for moral education and takes account of modern work ethics, development psychology and philosophy of religion. It presents its findings in a way which can be appreciated by specialists and non-specialists alike. By making a distinction between the form of the moral consciousness and the content of particular moralities, Peters reconciles the development approach of Piaget with the approaches of other schools of thought, including the Freudians and social learning theorists.